Rank: #224 out of 281. ✪ FREE ACCESSORIES: We give you 2 extra side-brushes and an extra HEPA-filter for free and after that we send you FREE side-brushes and HEPA filter whenever you need to replace them! Don't waste any money and time on buying these accessories when you choose our automatic vacuum cleaner robot! ✪ ALWAYS READY TO CLEAN: With 2 side brushes, a powerful suction and its remote control, our unbeatable Clymen Q7 is always there when you need it! Whether your pet is shedding too much fur, your baby is spilling its milk again or you were in a rush and spilled your coffee,... Its HEPA filter and primary filter with double filtration also vacuums up to 99% of allergens, pollen and dust particles, avoiding allergies and other diseases. ✪ MULTIPLE FUNCTIONS: Your house will never be messy as this floor cleaner has different cleaning modes and adapts to different floor types: carpet, wooden floors and tiles. It has anti-drop sensors and easily goes under furniture. ✪ LIFE-CHANGING GIFT: Don't know what to give to your loved one or mother? This home robot vacuum will help you make them happy. 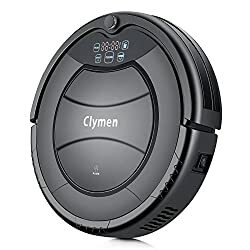 <br>And, we also thought of you, brilliant customers, who want to have the choice out of different models, so have a look at our other robotic vacuum cleaner and mop Clymen Q8 and Q9 which have different functions to see which suits you best. ✪ WE PROVIDE: Our robot vacuum is easy to use with our online video manual and a written manual delivered together with your package. We offer 12-month warranty and extensive after-sales support. All robotic vacuum cleaners purchased have one year warranty, Accessories are not included in the warranty. Clymen Q7 is a popular and one of the less expensive options. It's in the top 3 bestselling robotic vacuums and has dozens of popular alternatives in the same price range, such as CleanMate QQ6 or Pyle Gyro Sensor . Clymen Q7 is $100 less expensive than an average robotic vacuum ($249.99).